A: Once your baby is crawling, things will change. Part of being a responsive EC'ing parent is recognizing that your baby has entered a new stage. You may have more misses until you get back in sync—this is normal. A newly mobile baby is excited by all the things she can reach and play with. One strategy for keeping her interested in sitting on the potty is to have a few new things for her to play with while she's sitting there: perhaps a basket of novel objects, a new book, or something else which will appeal to her. Bringing the potty to her is also much more helpful than trying to take her away from something she is interested in if you sense she needs to go to the bathroom. Or try a variety of other locations or other potties for her to try. Some people find that their baby temporarily prefers to pee outdoors; others find that this is a good stage to transition to the toilet with a toilet insert. Keep talking and communicating with your baby about what she is doing. Even though the crawling stage can present new challenges, it can also make things easier, because it enables your child to signal to you in new ways. 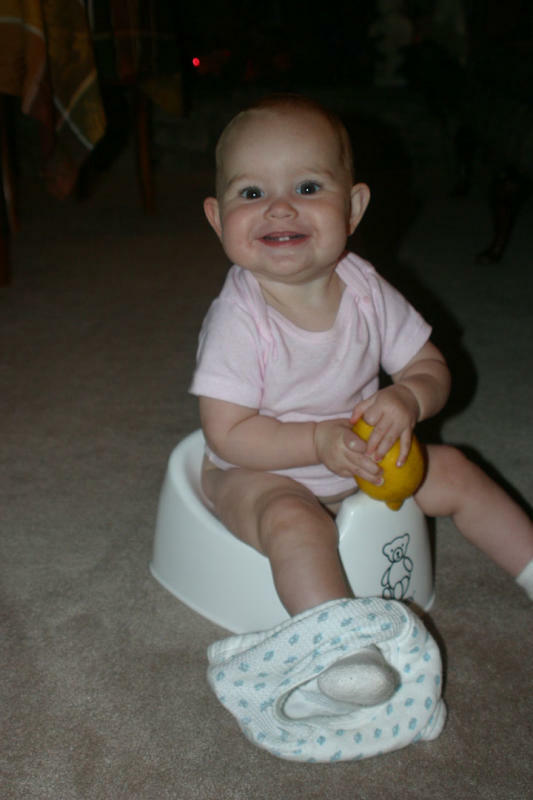 You may see your child crawling towards a potty when she has to go to the bathroom, or even crawling towards a bathroom. She may also crawl towards you when she has eliminated without you noticing, to ask you to assist her in changing into fresh clothing.